If you want to see in English, please see bottom of this article. 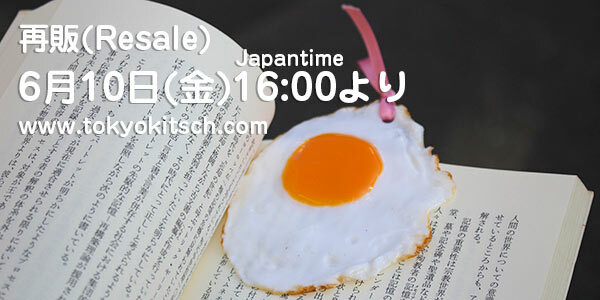 On June 10 (Friday) 4:00 PM, 50 of our much talked about food bookmarks will again be available for purchase. Orders can be made both domestically and from overseas. ***We won’t be taking advance orders. ***We cannot reply with an answer to individual inquiries. ***With each order, you can only purchase one of each type (meaning eight at the most). ***In cases when an order is placed when we don’t have stock, it will automatically become an advance order, and your purchase will be delivered within about a month. ***Even if there is stock when you add a product to your cart, it may have sold by the time you make the actual purchase if someone else makes an order at the same time. ***Because of changes to EMS delivery costs, we have also introduced an international ePacket service. It takes longer than EMS, but it allows us to deliver at a lower price. ***If you create an account in advance, your shopping will proceed smoothly once sales resume.